Perhaps no other train was as popular, and as quickly forgotten over the years as the Rexall Train. 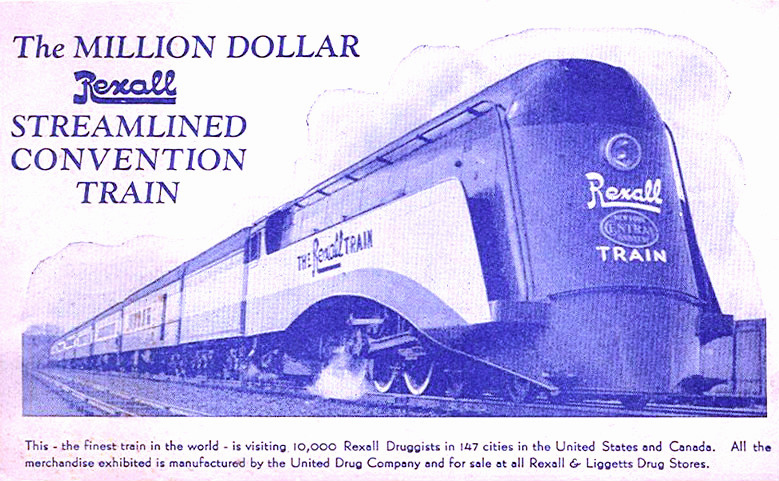 This publicity endeavor was carried out by the United Drug Company (Rexall), founded by Louis Liggett, along with the assistance from several railroads, most notably the New York Central. The train went on a months-long tour around the country during 1936 as a rolling national convention for druggists. During a time when the United States was still pulling itself out of the Great Depression the concept proved incredibly successful with millions visiting the train during its many hundreds of stops. Towards the end of the year the party was over and the equipment returned to its owners. Amid struggling times, Louis Liggett wished to host a national convention for druggists (pharmacists) across the country. Realizing, however, that financial struggles would likely see low turnout at a central location Liggett came up with the radical idea of hosting a rolling convention by rail. It wasn't long before he had acquired the needed equipment for such a train. The consist included twelve heavyweight Pullman cars, which were leased through the company (Pullman) while the New York Central allowed the use of 4-8-2 #2873, one of its Class L-2c "Mohawks" (a product of the American Locomotive Company). To make the train really standout the equipment was completely overhauled and given a streamlined look, an entirely new concept that was all the rage having just debuted on the Union Pacific and Burlington a few years earlier. The NYC was one of the first eastern systems to delve into the streamliner craze when it debuted the Mercury around the same time. 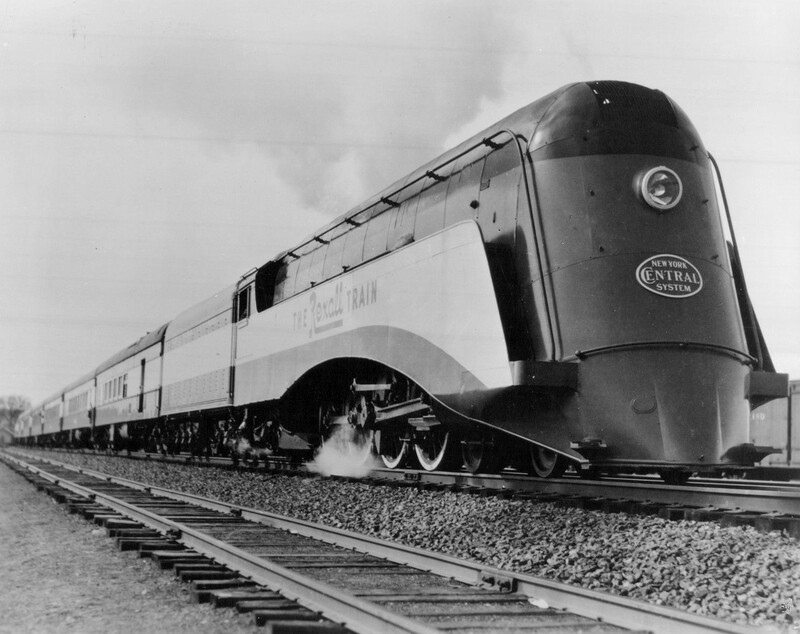 The railroad was also the first to streamline a steam locomotive in 1934 when it shrouded Class J-3a Hudson #5344 for the Commodore Vanderbilt. This was the inspiration for #2873, which received an almost identical shrouding. 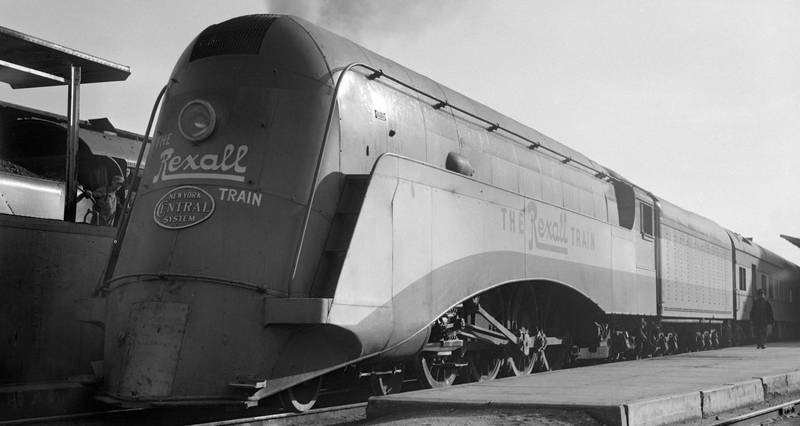 What was dubbed "The Million Dollar Rexall Streamlined Convention Train" featured a livery of blue and white, Rexall's corporate colors, with "The Rexall Train" adorning #2873's skirting as well as its nose. The entire consist was very well planned and coordinated: all twelve cars were named for the latest Rexall products with some open to the public as exhibitions; the other seven were either private or available only to druggists and store owners. To further enhance its appeal the train was entirely air-conditioned. A brief overview of the twelve cars are provided below, including their Rexall name, use on the train, and disposition. To learn more about the histories of the equipment please click here. Kantleek: A baggage-club car that was formerly known as Whitney under Pullman. It was used primarily for storage and work space while also housing the generators and other equipment which powered the air-conditioning and lights. First Aid: A 16-section sleeper built as the Haldeman under Pullman, it was used as sleeping quarters for the Rexall staff and crew. Ad-Vantage: Known as the Lanesville by Pullman it was a 36-seat parlor car rebuilt to feature displays and Rexall products. Research: Built by Pullman as the Norwich, it was a 36-seat parlor car rebuilt to feature displays and Rexall products. Bisma-Rex: This car was built by Pullman as Bolton, it was another 36-seat parlor used for displays and products and open to the public. Cara Nome: This car was built by Pullman as the Halifax and was yet another 36-seat parlor rebuilt for public displays and products. Klenzo: Built by Pullman as a 36-seat parlor and named the Hadlyme the car was reconfigured into a lecture car during the day,with 88 seats, and at night a dance hall where guests could enjoy the sounds of the 4-piece, "Rexall Train Orchestra." Symphony: This car was built by Pullman as a 16-section sleeper and known as the Wanakena. It was rebuilt into a diner for druggists and the train's staff. Adrienne: Known as the Hingham under Pullman this 36-seat parlor was rebuilt into an 88-seat lecture car. Mi-31: Another 36-seat parlor originally known as the Montwait by Pullman the car was reconfigured into a bar-lounge and dance hall for druggists and Rexall store owners. Joan Manning: Known under Pullman as the Ridgeville and built as a 10-compartment sleeper and used as sleeper quarters for the train's staff. Puretest: Built by Pullman as the Newport it was a 4-compartment sleeper observation-sleeper used as the private quarters of Louis Liggett. The Rexall Train spent three days on display in Boston, Massachusetts before it officially departed on March 29, 1936. During the next eight months the train galloped around the country visiting every state, including portions of southern Canada, except Nevada. According to Mike Schafer and Brian Solomon's book, "New York Central Railroad," the Rexall Train traveled some 29,000 miles, stopped at 200 cities, and entertained 10,000 druggists and 20,000 Rexall salespersons. Additionally, for the sections open to the public 2.3 million visitors made their way through the train perusing all of the latest products the drug company had to offer. For store owners Rexall setup the cars in ways to provide them ideas of to how arrange their own stores. For more reading and history about the train please click here. The train made its last stops between November 22nd through the 24th visiting its final city of Atlanta, Georgia. The concept had proved a smashing success although, interestingly, was never replicated by another major corporation. Soon after the train completed its countrywide tour #2873 was returned to the New York Central and its shrouding removed. The cars were subsequently sold to various railroads: Kantleek became Gulf, Mobile & Ohio #419; First Aid went to the Southern Pacific for maintenance-of-way service; Ad-Vantage, Research, Bisma-Rex, and Cara-Nome all went to the Pennsylvania; Klenzo eventually found its way on the Missouri Pacific, along with Adrienne and Mi-31; Symphony was sold to the Atlantic Coast Line; Joan Manning was later used by the Royal American Shows; and Puretest became Northern Pacific business car #4.